Leadership growth? Check. Messaging and public speaking? Check. Networking? Check. If this sounds like the curriculum of a professional development workshop, you’re partly right. Those are some of the topics included at political training, delivered in Seattle and around the state by several non- or multi-partisan organizations. And on second look, these courses offer broad, career-boosting benefits, even if running for office or organizing a campaign isn’t on your current list of goals. Groups like Amplify, the National Women’s Political Caucus of Washington (NWPC-WA) and Wellstone Action hold their training sessions with the goal of building a more diverse candidate pool for all levels of government. But as the need for greater diversity extends to the business and nonprofit sectors, political action training can be a pathway for those who seek the skills that will help them ascend to a leadership role. The courses cover the nuts and bolts of how to engage in the political process. 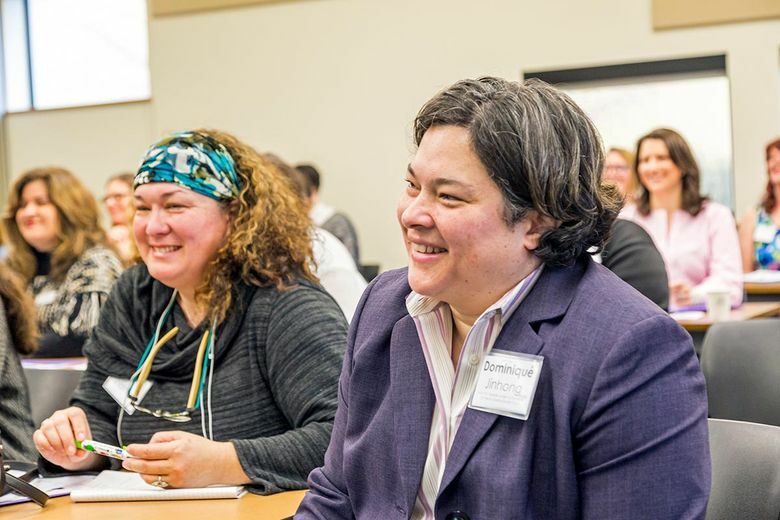 However, the skills that come into play are integral to driving change in any setting, “whether that’s political, or your place of business, or as a student — wherever you lead and do your work,” says NWPC-WA president Maggie Humphreys. Camp Wellstone’s three tracks — grassroots organizing, campaign management and candidacy — vary in content, but there, too, the skills taught are transferable. Among the topics Ulibarri lists are fundraising, budgeting, values-based communication and turning an idea into a real work plan. Through its membership model, the NWPC-WA has a built-in mechanism for facilitating network growth, notes Humphreys. It does this with events throughout the year, including miniature salons on topics like public speaking and confidence, or running for boards and commissions, plus gatherings to celebrate its endorsed women candidates. “We have an environment of women supporting other women,” Humphreys says. Pérez laughs as she recounts the terror she felt the day she attended her first NWPC-WA class, but says it doesn’t have to be that way. “When you go, you will start realizing, ‘OK, this is the plan I have to follow, and I’ve done this before in other areas of my life.’ ” Which is to say, the best kind of training is the one that shows you the leader that already exists within.